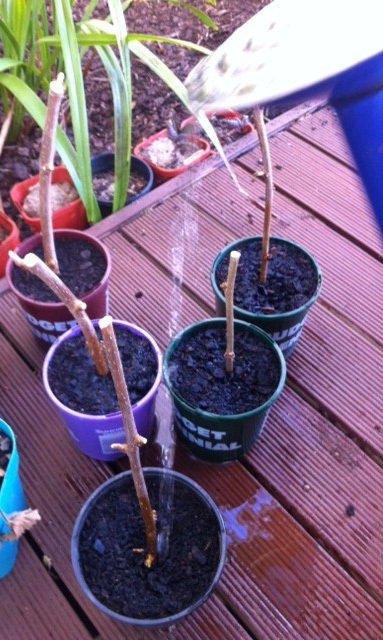 In my latest adventures in frugal gardening, I scavenged some mulberry tree cuttings via Facebook (thanks Deb & Udo!) to try growing a new tree. This is an experiment for me as I have never really ventured down the propagation path much in gardening. I’m sure based on these photographs, seasoned experts at this sort of thing will chortle heartily at my technique in trying to create a new plant life from an old one. Mulberry trees are apparently very easy to grow from cuttings, and although it’s a slower method to receiving fruit from the tree, there is always the delight of being able to keep silkworms. However, this experiment strikes me as a really cool learning experience for my little 4.5 year old sponge-brained daughter. We’ve grown plenty of stuff from seed so she is aware of how plants grow, and that trees drop seeds, but when some trees drop branches, new life can begin too, and I don’t think I’ve ever mention this to her. So I explained what we were going to do and said I needed her help. I explained what we doing in terms of creating ‘children’ from the ‘parent tree’ and that it was a bit like Stick Man and the family tree. (Stick Man is one of our favourite stories – an excellent book by Julia Donaldson of Gruffalo fame). She filled the pots with soil and helped me decide which branches to cut off. She then dipped them in water, dipped them into rooting powder and stuck them into the pots. Here they are (no laughing seasoned experts!) We only did 5, as little nearly-one-year old has a limited patience with anything he can’t eat, but I plan to do more over the coming days, maybe with a few different techniques to see what works. Sprouting in a bowl of water before planting could be one option.